We’re about to be treated to another episode in the continuing story of the attacks by the coal industry and its friends in Congress on any effort by the Obama administration to reduce mountaintop removal’s impacts on coalfield communities, protect the world from greenhouse gas pollution and ensure mining industry workers make it home to their families after each workday. — Expose the United States to liability for taking the value of privately owned coal through regulation. Every day thousands of hardworking coal miners go to work to put food on their families’ tables and keep millions of American families supplied with reliable, low cost electricity. The Obama Administration has actively sought ways to put an end to the coal industry through onerous regulations and activist rulemaking. This bill will ensure that this Administration cannot continue its efforts to increase the cost of energy for millions of Americans and put thousands of coal miners and coal industry related workers out of work. The federal government should not be in the business of blocking production of one of America’s most abundant natural resources and the source of livelihoods in communities across the country. With this decision, coal communities can get back to the business of producing affordable energy for Americans and put more Americans back to work. Mining added 11,000 men and women to our payrolls over the last year, along with 17,000 new support jobs. 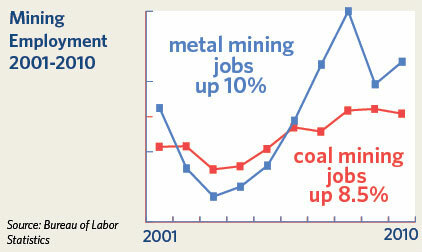 In fact, U.S. mining added thousands more jobs over the last decade-America’s first job-loss decade in 75 years. Jobs at U.S. metals mines climbed by 10 percent and coal mining employment rose by 8.5 percent since 2001 . . . mining support jobs grew by an astounding 32 percent. Since 2007, as production in Central Appalachia has shifted away from mountaintop removal and back toward underground mining, the increase in employment at underground mines has more than offset declines at other types of mines. Although mountaintop removal may benefit the bottom lines of big coal operators, it does not increase the number of coal mining jobs. Since mountaintop removal permits have been slowed by litigation and EPA regulation, mining jobs have actually increased in the region. The coal lobby has gotten quite skilled at shooting itself in the foot. Or would that be ‘hoof’? Congrats for the ‘catch’ and to Matt Wasson for making hay while the sun still shines. That first sentence / paragraph of this blog-entry is a doozie. Ken: The UMWA certainly doesn’t want to be confused with the NMA, but I must point out that when asked, we have been consistent over the last several years in saying that coal mining employment has risen (see http://www.bnd.com/2011/11/15/1942541/want-to-work-in-a-coal-mine-check.html). our membership levels were up in 2009 and 2010 and we expect more of the same in 2011. Increased coal mining employment is not news. Anyone who looks at the data provided by the Energy Information Agency (www.eia.gov) in its annual Coal Report can see this trend, which started in the last decade. However, I’m not so sure that the data presented above passes the logic test. 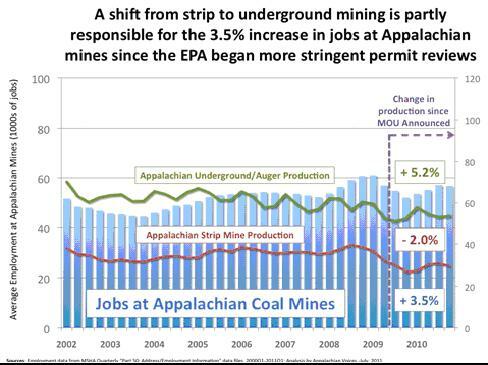 Just because overall Appalachian coal employment is up and surface mining employment is down doesn’t mean that one correlates to the other. That is a pretty facile way of looking at statistics. It would be good to see a more comprehensive study that takes into account several external economic and market forces, including the huge upsurge of metallurgical coal mining in Appalachia, almost all of which is produced from underground mines and would not be affected by a change in surface mining employment. Reducing mining of lower-sulfur steam coal from MTR sites does not lead to an increase in mining of metallurgical coal from underground mines. That’s comparing apples and oranges. Does this mean we can finally abolish the ridiculous “Job-killing EPA” term? I don’t want to belittle anyone who has lost their job during this recession…millions have including myself. But the market driven economy we live in has spoken. And sometimes it says “your services are no longer required” i.e. drop in demand. The economic downturn and lower demand for a resource that costs money to produce and use just happened to coincide with an increased interest in strengthening environmental regulation (incidentally creating a well paying job for me, whereupon I could afford a house thus helping the foundering housing market, creating jobs for contractors, etc. etc.) which only appeared to “kill jobs”. Yes, some folks have lost their jobs but it certainly had more to do with the state of the economy more than increased permit scrutiny, at least recently. If one wants to be really thorough in determining what drives shifts in mining jobs I think they would have to consider technological advances that have made less humans on a mine site, underground or surface, a business decision by the mining companies to save money and increase their profit margin. Labor is expensive, and if a machine can do the same job more efficiently then most likely the company will choose the machine. Matt and I have been discussing this for years and it is nice to our trend analysis vindicated somewhat by the NMA. If indeed much of the recent increase in mining jobs is driven by underground production, I think it is a short term (3-5 years) trend as available reserves are put into production. Most analysts seem to agree that the larger, easier to mine, underground seams are just about exhausted across Appalachia and that a temporary increase in jobs due the shift to underground mines will not be sustained for very long. This is a trend that the States, the NMA, and industry as a whole should prepare for. With luck and perseverance by regulatory agencies and environmental groups, the shift back to surface production in order to maintain supply and keep jobs alive for locals will not turn the eastern coal fields into a national environmental sacrifice zone. You’re wrong about one thing (well, at least one) — this is most definitely news, given the extreme political rhetoric from the mining industry and its friends amount the region’s political leaders. There’s no question that they talk as if coal production and employment has dropped dramatically. I’m sure you would agree that sort of rhetoric isn’t helpful to anyone, and it certainly doesn’t appear that the mining industry’s friends in Congress are interested in the more detailed, thorough study you suggest — they just want to attack a Democratic president. Mr. Smith may be correct that most met-coal production originates underground for the region at large but not so in Southwestern Virginia – Your readers may recall that, after his dad sold off his coal holdings and became an hotelier, young Justice (asked for and daddy) acquired the former A-and-G company and indulged in some spirited Musical Letterheads. A-and-G is a surface-mining operator, one of Wise County’s top employers, with permits (old, new, and pending) in VA and KY. With little exception, they’re mining and shipping met-coal exclusively, most of which ends up in China and more recently Japan, where demand jumped after the tsunami/quake disaster. Believe me, UMWA members understand all too well the levels to which the junior Senator from KY will stoop to avoid talking about issues that don’t jibe with his extremist views. I can’t speak for nonunion miners, however. No question that met coal demand has helped replace the lost demand for steam coal. But the point is that jobs are way up, even as coal demand is down, which flies in the face of everything we’ve been hearing from some members of Congress. My questions to you is: Since the capacity of already-permitted coal mines is greater than capacity utilization (by the greatest amount in at least 25 years), and EIA data show that capacity utilization in Appalachia is even lower than in the West or Illinois Basin, how is it even possible that a lack of new permits could be the limiting factor for coal production? Simple fact of the matter is that any time a new MTR mine is permitted and developed, the coal that it produces displaces coal that would otherwise have been produced elsewhere – most likely from underground mines that generate more jobs. It’s not as though permitting a new mine somehow creates demand for the coal it will produce. It’s hard to check your comments without a link to the data. All I could find was the Fed’s report on “Mining” and not coal in particular or even Appalachia coal where the major permitting issues are. If capacity is high and utilization is low then isn’t the conclusion to be made that there is plenty of equipment in place to produce but something like a lack of permits is keeping the utilization of this capacity low? There could be several explanations but your logic seems wrong or maybe you can explain. I agree with Phil’s analysis on the impact of met coal demand. That is where the increased employment has come from. Search for “N2121” to skip down to the coal mining data. My analysis was based on annual averages for the first 10 months of each year back to 1986 (so that 2011 would be comparable to previous years). Same result if you compare Jan-Oct of 2011 with Jan-Dec of previous years. The problem with your suggestion is that industrial capacity only include mines that are already permitted and producing coal, so obviously a lack of permits isn’t what is keeping utilization down. The only thing keeping utilization down is a huge drop in demand for coal from U.S. power plants — and the fact that the increase in demand for met coal has only partially offset the electricity sector demand drop (which can mostly be attributed to the drop in natural gas prices). Does that help clarify the logic? Casey, I’m sure from a previous post from Matt demonstrating the underutilization of capacity that when he says “active and permitted” that getting permits is not the reason they are running under capacity. Permitted mines are running under capacity, which is more a market decision. The bottom line of the post, from my perspective, is that if Obama has been waging this effort to put miners out of jobs and the coal industry out of business, then he has failed miserably. What I’d really like to see is the coal industry leaders acknowledge reality: mine jobs have not plummeted since EPA started taking the steps it has; there are not 10-11 spinoff jobs for each miner; there are not 250 years worth of coal left; streams and mountains aren’t put back better than they were before; mountaintop removal is not an economic boon to neighboring communities; communities near mountaintop removal face greater rates of health problems; the world’s climate is changing and burning fossil fuels contributes greatly. Just a simple acknowledgment of these basic facts would go a long way to make progress for a better future for Appalachia. There have been moments of acknowledgement: this post about the increase in mining jobs; Nick Rahall’s statement about whatever number of years of mineable coal left; Bray Carey’s acknowledgement of climate change. Sorry, I might not be the one to agree with your basic “facts”. The devil is always in the details and everything requires closer examination to come to the correct conclusions. The increase in coal mining jobs is one area that requires analysis. I believe that Matt’s analysis is misleading as to the cause and effect just as Phil has stated. It certainly is very difficult to isolate variables and determine effects from single causes when many things are occurring but the market prices for coal (met and steam) in the period quoted has the biggest effect on employment. See the below chart for met coal. There have been many new mines started or being started in WV to satisfy world demand for met coal to make steel and employment has increased from that. China and India’s growth has been huge and even with lower projected growth of China’s economy at 9% there is still robust growth in commodity demand. Steam prices have also shown steady increases- see below. Coal companies react to market prices by increasing capacity. Another reason for increases in employment has been from the rules imposed and the enforcement increases in underground mines. These have created additional jobs to meet compliance. Another misinterpretation of the data is stating the EPA’s stance on not granting mining 404’s (for surface mines and for the necessary refuse fills required to support deep mining) is not and will not have any adverse effects on mining employment/production. It is very easy for a coal company to state that they anticipate no problems in 2012 with permitting issues if budgeting guidance is to only project mining where permits are in hand in 2012. That says nothing about what will happen in the out years and you only have to read the annual reports under risks to see that. There IS a crisis and it WILL develop and manifest itself in Appalachia. It is basic common sense for anyone that understands mining. Ken states that the coal supporters only want to attack a Democratic President. I believe the rational has to do with the aft fore mentioned crisis that is occurring with mining 404’s and other coal generation regulations, and is not a party issue. Casey, you said “Another reason for increases in employment has been from the rules imposed and the enforcement increases in underground mines. These have created additional jobs to meet compliance.” You almost conceded at least one point, that regulation is not the job-killing war on coal that the industry claims. There will be a coal jobs crisis coming as the industry persists with business as usual, and there is a sharp drop in Appalachian production over the next few years as Downstream Strategies has pointed out from EIA data. Even coal companies are admitting the projected drop to their stockholders. It will be great when their employees and media folks get the memo. Re: Ohio Republican Bill Johnson’s bill called the “Coal Miner Employment and Domestic Energy Infrastructure Protection Act”. I think it’s great (sarcasm) that he thinks he can legislate economic conditions. But if that’s the case, why stop at coal? He should introduce a bill that prohibits Congress from taking any action that causes or contributes to the continuing unemployment of the millions of Americans without jobs. That’d be a nice Christmas present. Casey, my response from last night is still awaiting moderation – presumably the links to the data that I included set off the WordPress filter. In the mean time, Vernon has nicely clarified the question about capacity (it only includes mines that are already permitted and active), so I’m a little confused as to the relevance of your statement that “Coal companies react to market prices by increasing capacity.” That’s partially true – both prices and expected demand would play in to that decision – but you can’t add capacity without valid permits. In other words, permits are NOT the limiting factor for production. That’s the point. But I found your statement about how underground mines are increasing employment due to enforcement of safety laws as eyebrow-raising as Vernon did. I couldn’t agree more with your statement. So why won’t you admit that the same logic applies to compliance with environmental laws? The whole package of misinformation that NMA and members of Congress have been pushing out is based on the assumption that regulations inherently kill jobs. But you seem to recognize that enforcement of safety regulations does create jobs – does that only apply when you protect miners, or would it also apply when you protect the safety of communities around those mines? 1. Demand for coal is way down due to competition from natural gas (coal has produced just 43.1% of US electricity so far this year) and increases in met coal demand only partially compensate for that decline in steam coal demand. 2. The capacity of U.S. coal mines has continued to increase in recent years, even as capacity utilization has fallen to historic lows. 3. Even as Appalachian production has declined in recent years, employment has steadily increased. 1. EPA’s and OSM’s actions regarding mountaintop removal permits is not a limiting factor for coal production – demand is the limiting factor. 2. That fact, combined with the facts that there is plenty of excess capacity at underground mines in Appalachia to replace most mountaintop removal coal production and mountaintop removal mines generate fewer jobs than underground mines, the only logical conclusion is that to the extent to which EPA’s and OSM’s actions lead to fewer mountaintop removal permits being granted, underground mines will take up some of that market share and increase overall employment. That’s not to paint a rosy picture for the future of the Appalachian coal industry – as Vernon notes, the reserves of high-quality and easily accessible reserves of Appalachian coal are dwindling fast. But in the mean time, I just don’t understand why you can’t admit that EPA’s actions are at worst neutral in terms of employment and at best a significant job creator. Is it simple cognitive dissonance that won’t let you get there? If we are mining thinner and thinner seams, using less and less longwall, and so forth, how can our (central Appalachia) capacity be 20% higher than 2007 levels? The following is copied from the Federal Reserve data. Sufficient availability of inputs. I know that access to rail cars has limited output in the past. The number of available workers limits output. I wonder if the Federal Reserve considers a union work schedule or a non-union work schedule realistic. Why isn’t there anything in there about making a profit? I would say that the Federal Reserve has no ability in deciding what the capacity of an Appalachian coal mine is. The following is also copied from the Federal Reserve data. From 1972-2010, the coal mining utilization rate is 85.7. Makes me ask the question, can we go much higher than we currently are at 79.2. Do we have a situation here like structural unemployment? The answer is that, contrary to the misinformation we’ve heard about a “permitorium,” a large number of mines have been permitted and developed since 2007. That is part of the problem for CAPP producers – we’ve had a huge increase in permitted capacity at the same time that demand has tanked. Which gets to your second point about sufficient availability of inputs. It’s not just inputs that that can limit capacity utilization, but demand for the output as well. And that is clearly what’s happening with the coal industry in Appalachia and across the U.S. – steam coal demand has dropped by more than 7% since 2007, and the increase in met coal demand has not compensated for that loss. We can definitely agree that capacity utilization will never be 100%, and it would probably be terribly unsafe for miners if it were – there’s a reason why 10-15% of capacity doesn’t typically get used. But let’s put those numbers you provided in perspective. The difference between the 1972-2010 average utilization rate and the figure you provided for October, 2011 is 6.5%. Actually, the 2011 average utilization has been 77.1%, which would be a better number to use, as October tends to have higher production than most months of the year, but we’ll stick with the numbers you provided to be conservative. According to the EIA, the total productive capacity of US mines in 2009 was 1.43 billion tons (that would be higher now, but EIA hasn’t provided updated info yet, so again we’ll use the 2009 data to be conservative). Multiplying 1.43 billion tons by 6.5% gives you a figure of 93 million tons of excess current capacity relative to historic levels. As it turns out, Central Appalachian strip mine production in 2010 was just 85 million tons, meaning you could shut down every single Central Appalachian strip mine, replace that production with already-permitted mines, and still be below historic average utilization levels. Granted, that’s a simplified analysis and differences in coal quality and transportation routes from other regions mean its not as simple as replacing CAPP surface production with a bunch of coal from the Powder River Basin, but it helps put those numbers in perspective. Another way to put those numbers in perspective is to look at how long it will be before we would get back to that average 85.7% utilization rate if capacity were to remain where it is now. The EIA, which always, always, always over-projects future coal consumption, forecasts that it won’t be until 2024 before coal consumption increases by 93 million tons beyond 2011 levels. So to address your final question, I believe we do have a problem similar to structural unemployment – we have a structural over-capacity situation in which we are permitting and developing far more coal mine capacity than is needed to meet demand. That’s why so many small producers are getting pushed out and we’re seeing unprecedented consolidation of the Appalachian coal industry into a few large companies. People will have different opinions on whether that’s a good or a bad thing, but the point I want to make is that it has nothing whatsoever to do with the EPA or the OSM. You missed the entire point of my post. I can assure you I do not “accept” all your “facts” (or at least the application of those). How can somebody in Washington put a capacity on a mine in Appalachia? Why isn’t profit considered when talking capacity utilization? I can have a million ton per year “permitted and developed operation”. If I can’t make money operating it, the capacity utilization is going to be zero. It’s not somebody in Washington that assesses mine capacity, Observer. Government data come from reports submitted by coal companies themselves. Same goes for capacity utilization. Profit may very well influence how much capacity is utilized, but the numbers themselves are agnostic as to the factors that led to them. But I certainly wouldn’t argue with your other point – it gets right to the heart of what’s been going on. As I’m sure you’re aware, natural gas prices have declined below the point that many Central Appalachian coal operators can compete for electricity generation market share. According to SEC filings, production costs for Arch, Alpha and ICG in Central Appalachia have tripled over the past decade to something in the $60-$70 per ton range. Almost all of that increase occurred when Bush was president, not Obama. It’s not about EPA’s enforcement of the Clean Water Act, Observer — it’s the geological reality that the highest quality and cheapest to access reserves in the region have been mined out that has led to most of the increase in production costs. And that shouldn’t be surprising, as energy analysts have been warning about reserve depletion for well over a decade. You stated “So why won’t you admit that the same logic applies to compliance with environmental laws?” and are referring to certain safety laws that affect deep mines by adding costs due to various things including additional manhours. Yes Matt certain environmental laws in mining have increased employment. There you go. But that is not what is happening now to any extent and that is not always true in a competitive commodity market. The increasing price of coal, and in particular met coal, is largely why employment has been increasing. Anyway I thought your point was that EPA’s stance is what is causing increased deep mine employment. Anyway to say all environmental laws will increase employment is false. Obama’s EPA’s stance on not granting 404’s for fills will slowly kill surface and deep mining in Appalachia. This is not job neutral to WV. Matt, can you see that this is true? I appreciate your acknowledgement that environmental laws are not fundamentally different than mine safety laws in their potential to increase jobs, Casey. It shows a level of intellectual honesty that is in stark contrast to outfits like NMA and UMWA (in regard to the latter, I refer specifically to the leadership). There’s just no getting around the fact that demand for coal is way down and is unlikely to recover in the next few years if ever (at least according to every forecast I’ve seen from a federal agency or reputable independent analyst). Given the low cost of shale gas and the phenomenal rate at which renewables are decreasing in price, (not to mention the imperative of reducing greenhouse gas emissions, though there’s no need to get hung up on that for the sake of my argument), I strongly suspect domestic demand for steam coal will never recover to 2008 levels and will continue to decline at an ever increasing rate. Before the MOU on mountaintop removal, coal industry trade journals were full of predictions that many underground mines in Appalachia would be, as the Coal and Energy Price Report said, “Pushed off a cliff.” To the extent that EPA actually has reduced the number of mountaintop removal mines that are permitted, it just shifts how the “right-sizing” has occurred. Specifically, it has meant that the rate at which large surface mines have been pushing deep mines “off a cliff” has been reduced. Not only do deep mines generate 50% more jobs than surface mines in Appalachia, but a much greater proportion of those are union mines, making it a double benefit in terms of mine employment. It’s as simple as that, Casey. In addition, you know very well that EPA has not halted 404 permitting, but has simply slowed it down. That’s unfortunate for both the environment and health of Appalachian communities and the economy of the region because, in the circumstances we find ourselves in today, EPA’s actions are not job neutral, they are job creating. Where exactly in the EIA report does it attribute these changes to EPA actions?